It's A Wonderful Life is a life-affirming movie released in the year after the end of World War 2. It has endured as a story of hope and of believing in the good that life has to offer. The son of the local banker who specializes in providing home loans for the disadvantaged, George Bailey (James Stewart) grows up in the small town of Bedford Falls. He is a dynamic young man who dreams of leaving to the big-city college and of eventually achieving greatness in engineering. He embodies the dreams of a country with unlimited potential, emerging victorious from a tumultuous war. Events in life take unexpected turns. Bailey has to take over his father's bank and becomes a beacon of good in a community otherwise dominated by the evil financier Mr. Potter (Lionel Barrymore). A series of poorly-timed crises gradually conspire against Bailey and finally force him to reluctantly abandon his dreams of ever leaving Bedford Falls. His brother achieves fame in the military and his friend achieves riches in the emerging world of industry. George Bailey just gets married to the beautiful and supportive Mary (Donna Reed), has several children, moves into a dream house, and develops loyal long-standing friends and the gratitude of the entire community. But one final crisis at Christmas pushes Bailey over the edge, and he decides that he is more valuable dead than alive. At the moment of suicide, a guardian angel intervenes to demonstrate the true meaning of life. 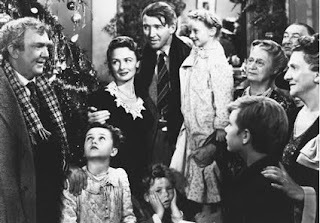 Frank Capra directed It's A Wonderful Life in a whimsical style that never takes itself too seriously (George Bailey's entire life story is a flashback being witnessed by angels in the form of stars), yet nails superb heights of emotion when needed. In addition to the powerful final 30 minutes when George gets to witness what life would have been like without him, there are terrific scenes involving the developing romance between George and Mary, including a stunning telephone conversation where Capra captures what the dawn of love means without the lovers even talking to each other. James Stewart was born to play George Bailey as a complex, multi-dimensional man grappling with the forces of destiny, at the same time awkward and confident, decisive and full of doubt. Donna Reed and Lionel Barrymore are solid in support, but all the supporting characters are strictly one dimensional. A classic fairy tale for adults and a survival guide for the highs and lows integral to navigating through life, It's A Wonderful Life never gets old, just better with repeated viewings.